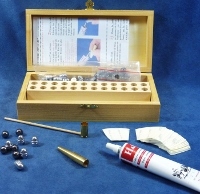 1 brass mandrel + 100 .36" calibre H&C combustible paper shapes + 1 nitrocellulose glue tube + 1 measurement tool + 1 set of 90 bullets including 45 round nose bullets (96% lead / 4% tin) and 45 round bullets (100% lead). Comes in a wooden box, with instructions for use. 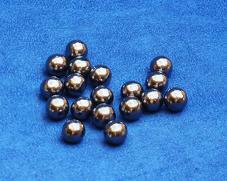 Very soft alloy, with a brighter aspect than pure lead bullets. Calibre .376''. 114 grains / 7.43 grammes. A 250 primers box to use with cap and ball revolvers. No shipment outside the EU (European Union). 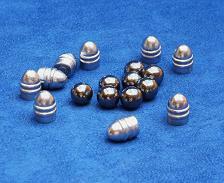 Classic 100% lead round bullets. 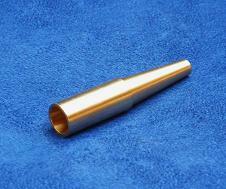 Can be use in a combustible envelope cartridge. Calibre: 374''. 83 grains / 5.41 grammes. 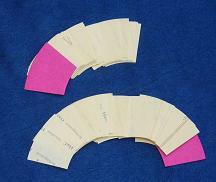 Used to give the right shape to the H&C flamable paper and to handle the paper case when making the enveloppe cartridge. 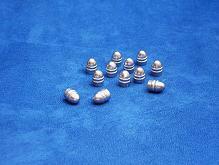 30 bullets pack : 15 round-nose bullets (96% lead + 4% tin) + 15 round bullets (100% lead). 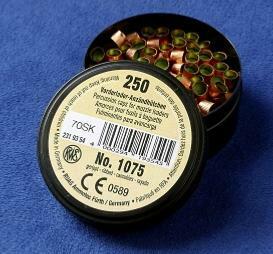 Allows you to pick the best match to make your own combustible enveloppe cartridges. 100 ready cut paper shapes to make 100 of .36" calibre combustible envelope cartridges. Use with round-nose bullets or round bullets. 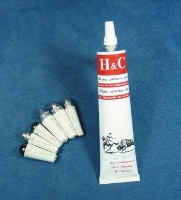 Does not leave any residue into the chambers when used with the H&C glue.